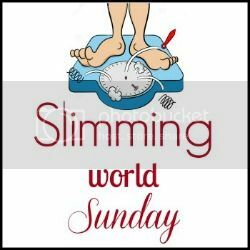 Slimming World weigh in #11 – the one with another certificate! After last week’s weigh in and an expected gain from J’s birthday festivities, I decided to knuckle down, go back to basics, and get right back on plan – all of which I (nearly) managed to do. As I gained 2lb last week I decided I wanted to lose that plus an extra pound so I made sure I ate lots of speed food. I had nothing to knock me off track – well, apart from chocolate fudge brownies and ice cream at the weekend, but that was the only ‘naughty’ I had all week that was out of my syns. But as usual, I kept my syns down for the couple of days after that. Before weigh in day, I’d been naughtily weighing myself at home to make sure the scales were going in the right direction so I went to group expecting the loss I wanted. What I wasn’t expecting though, was to lose 4.5lb! That’s my biggest loss yet, even bigger than my first week when I lost 3.5lb. Along with another member of my group, I was also awarded my first slimmer of the month certificate! After this weigh in I am on a proper high again – onward & upward (or downward!). Maybe next week I will get my Club 10 award – fingers crossed. I must try and get these updates posted quicker too as I’m always nearly a week behind!